These are the pieces I've currently selected as my best pieces. I may add or remove some over time as I improve, but hopefully these will give you a taste of my style. If you'd like to see all the rest of my art, please check out my galleries that I link to in the Links section. Click here for my most recent work! Another long overdue character trade for Kelt. 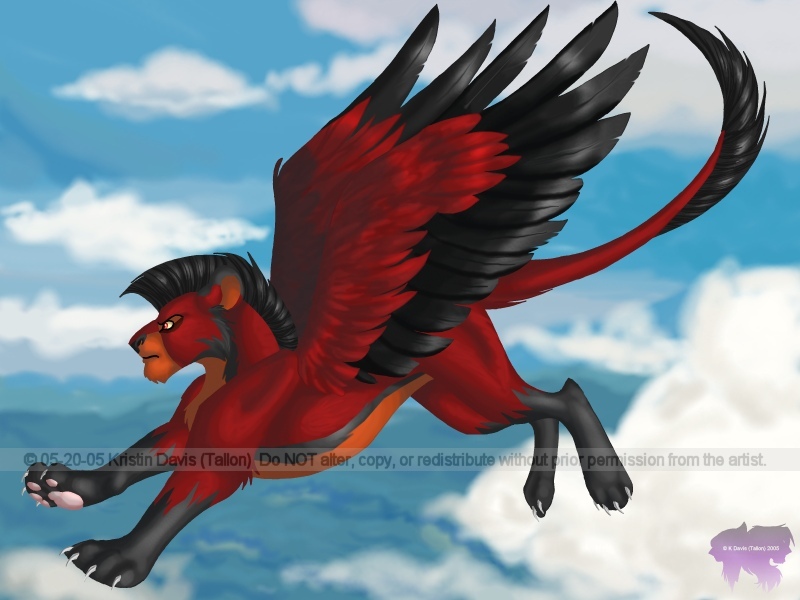 This is the Nebulion character I made for him named Yalon. She now belongs to Kelt Ryanson. A commission for Arazia of the characters Kamui and Rei. Characters © their respective owners. I did this for Tigrin's contest and while it didn't turn out quite as well as I would have preferred, I'm still happy with it. It's her characters Silence and Vampiress, and while it helps to know their background, the mini-comic sorta speaks for itself. Enjoy! Silence and Vampiress © Tigrin. 'Tis Dommi, the wild, ruthless Rhodri who takes over Ny-ormtur's tribe. This takes place right before the Circle of Life scene. Cub Simba was toying with a mouse (who would soon be unlucky enough to find itself in Scar's lair) before his mother scooped him up to prepare him for the presentation. 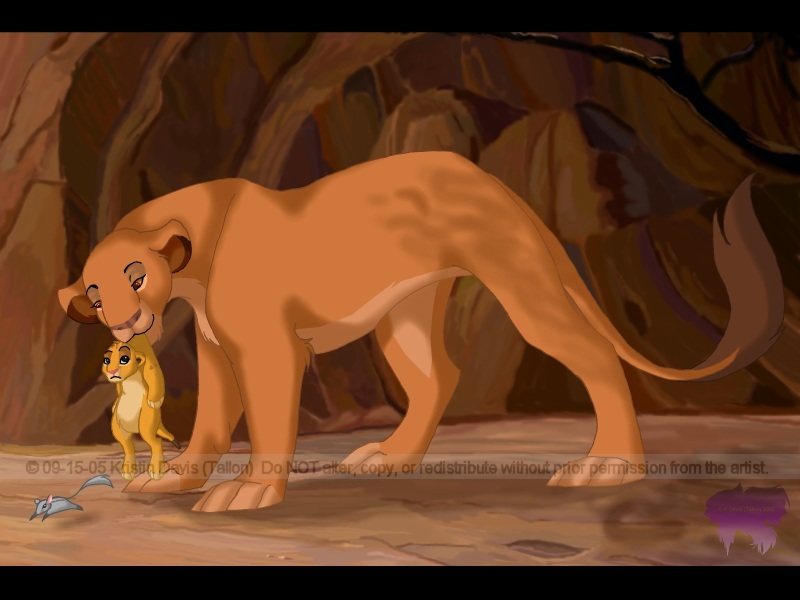 Sarabi and Simba © Disney. I referenced the background from the actual scene, but no tracing was involved at all. I enjoy drawing luminescent things and decided combining that with a not-so-commonly-used animal would be a good exercise. 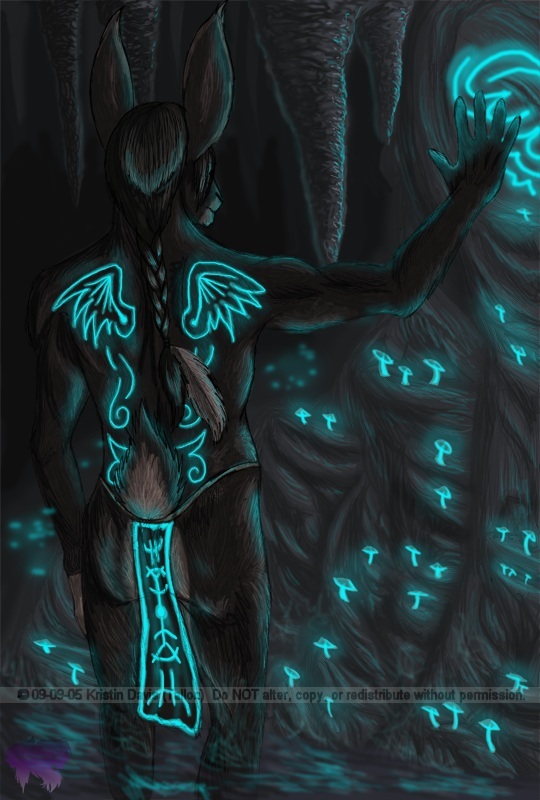 "Luminescent Rabbit" is definitely one of my best pieces thus far. Art trade with Akura of her character Shetani. I'm really happy with how this one turned out, too, since I usually shy away from feathered wings. Shetani © Akura. It's Kristin and Aleron seeking shelter in a cave during an April rainstorm. Also done for the calendar I made for Gerf. This is my half of a trade with Nitsuku. It's her character Anjiru (I think also called AnjiRubio, if I'm not mistaken) and I love how it turned out! Hope you like it, too! Anjiru © Nitsuku. Remember my original "Just One" picture? I redrew it because I loved the original but knew it could look better. So here's Kristin, yet again, having to fend off trick-or-treaters who don't know the meaning of, "Just ONE!" This took a few days to finish. 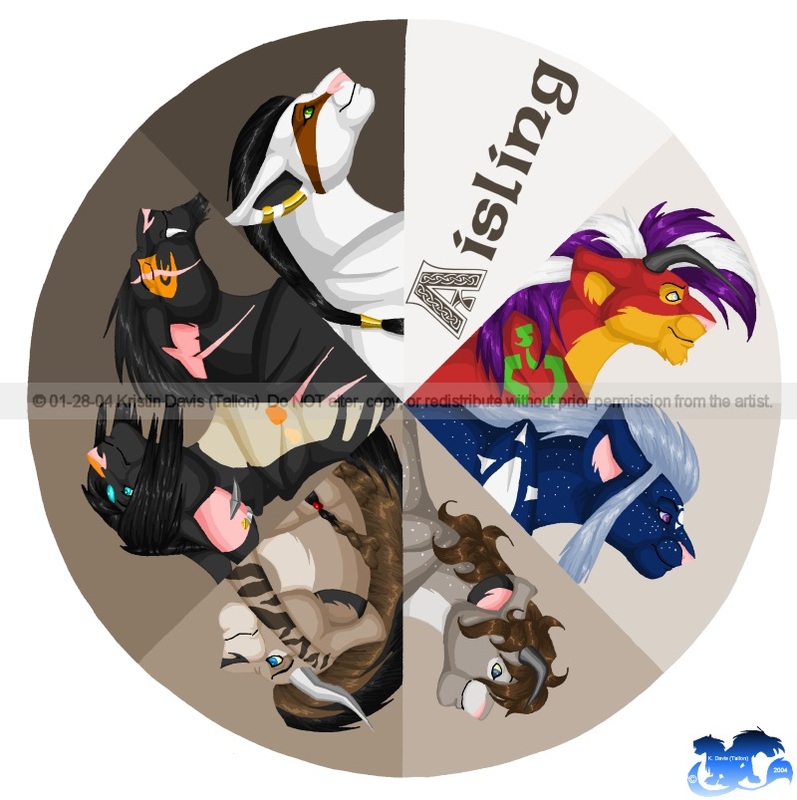 If you start from the word Aisling and go clock-wise, it's the seven major species of Aisling, each represented by a character from that species (belonging to either Kelt Ryanson or me): Rhodri (Hirudo), Elven Rhodri (Lothlorien), Anifeilya Rhodri (Orlo), Tarbhach (Ra'Kian), Kyonshi (The Lady), Ko'Drho (Nigel), and Nebulion (Minerva). This displays my most recent artwork. It updates every time I upload something new to my DeviantArt account. The script doesn't always work, unfortunately, because it depends on DeviantArt.com being able to work. All the graphics, art, and images (except for some banners) created on this page are © Kristin Davis (Tallon), so do not copy, edit, or redistribute them without permission. However, The Lion King is © Disney.